How much of learning is wondering? As I began the Thinking About Words Through Images 365 project this month, I was watching my kids and taking pictures of things we did in school. However, as the month went on, the weather in VA is SO unusual this year, I found myself thinking about what I was learning about it instead. I don’t have one picture to show my ‘vision’ of learning this month, but instead, felt like I wanted to describe the things I had learned and wondered about based on our weather. So I decided to document that instead. 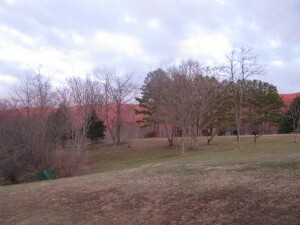 We have about 5 acres, part of which does not “perk.” That part also has an artisan well on it. In the summertime, it is sometimes impossible to mow part of the bottom field because it is so wet. We’ve gotten cars and boats stuck going down to the big shed! 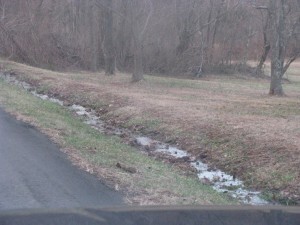 Our land also slopes down from the mountain (Afton Mountain, part of the Blue Ridge), so when it rains heavily, we always have water coming through our yard and also racing down the ditch beside our road. During the month of January, I was amazed to see the wet weather streams freezing over, and also surprised I could see them so well defined in the snow. I don’t remember seeing them ever before so clearly in the winter. In December, we got over 2 feet of snow, and then it stayed VERY cold (for VA in the winter) for over a month–so literally, a month later, we still had snow cover from that Dec. snow. Watching snow stick around and melt over time caused me to questions some aspects of snow and water that I’d never had opportunity to wonder about before. I heard on the radio that westward facing slopes were going to get upslope snow showers. I wondered why only westward facing slopes get them. 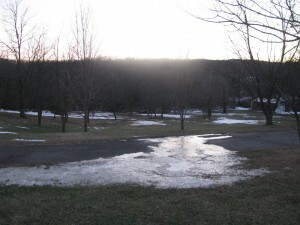 As I rode to school this month, I also noticed that westward facing slopes were not melting as fast as eastward facing slopes. Here’s a perfect example of the unevenness of the melting. It’s NOT a case of where the sun shines. Why would morning sun not melt the snow like afternoon sun? Why would upslope showers happen to the westward facing slopes? (corollary–How could I get kids to ask these same kinds of questions? Then I noticed that our wet weather streams were staying MUCH wetter than normal, and that it was so cold parts of them were freezing over. 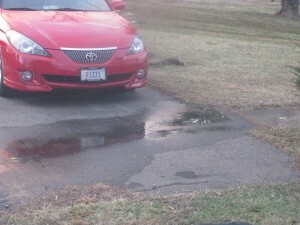 Practically the whole month water ran across our driveway. Was it the melting snow out of the mountains? It got so cold the whole stream would freeze over at night and then thaw during the day. 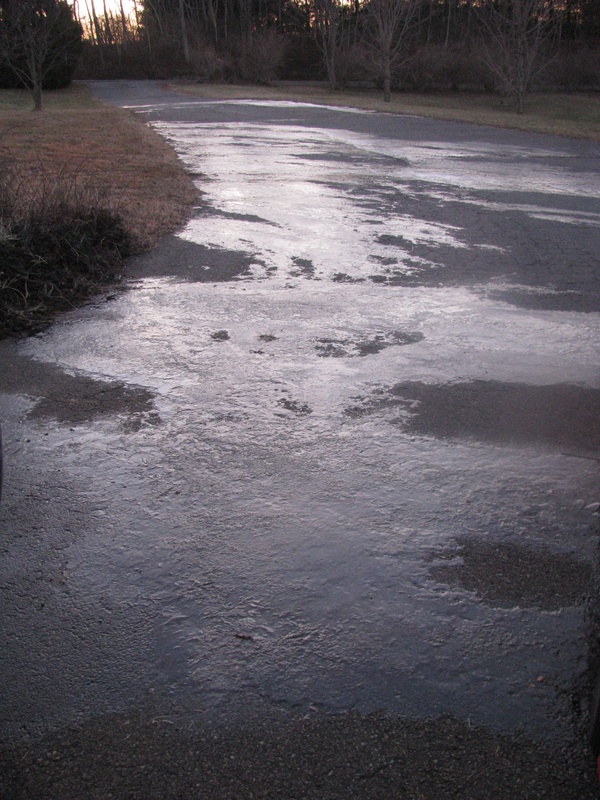 How could running water freeze? 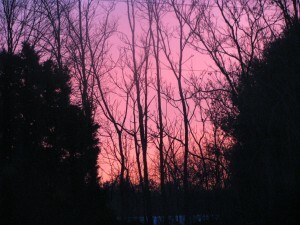 Every morning I see this view out of my living room bay window, but only some mornings are red. That made me think of the old saying quoted at the top of this page. The red goes away SO very fast. 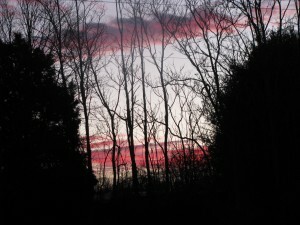 And then, on the way to school only red wisps of clouds are left. But it’s not just clouds–several days later I noticed the mountain. 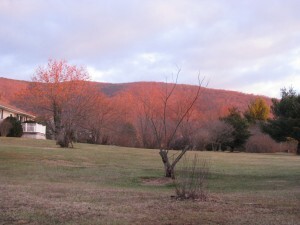 These are NOT fall colors, but instead the sunrise on the mountain. 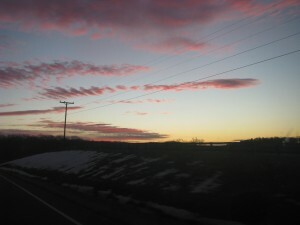 I saw this about a week after documenting the red sky on the way to work. Why does ONLY the side of the mountain look red? Why not other stuff the sun is lighting? Why does it look like the sun is catching the trees on fire? And why do the colors change? 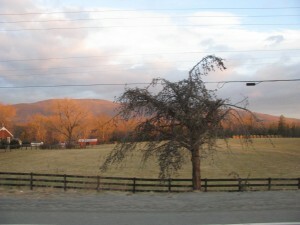 Just riding to school, it looked like the mountain was going through the fall leaf color change-on fast forward. 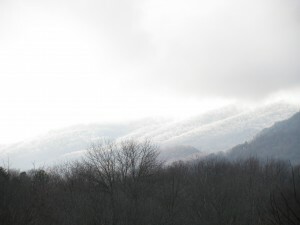 About halfway through the month, I realized I was often looking at the weather on the mountains nearby and I began wondering about student learning about weather–just what they really understood about fronts, winds, heat rising and falling, what things like fog, sleet, and hail really were, and I wondererd if my curiosity and picture taking could impact them. I haven’t tried it yet–We’ve missed too much school due to the weather! but then I realized it wasn’t snow. Zooming in, I realized it was fog in the dips and valleys on the side of the mountain. I hadn’t noticed this ever before, and I’ve been driving this road for 30 years. Why does the fog settle? Why in this way, today? 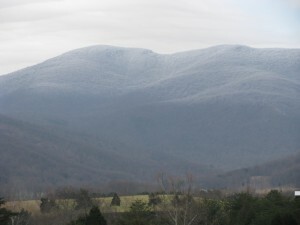 THIS is snow on the mountaintops–near Wintergreen Ski Resort, VA, over a month after the snow fell in December. 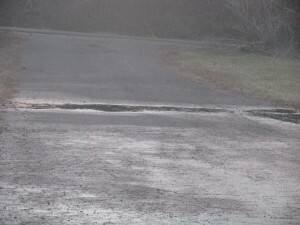 or are they each separate wet weather streams? 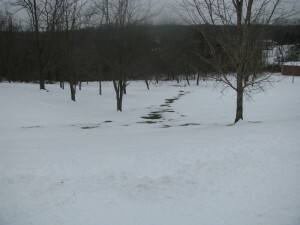 The big wet weather stream is still showing as it was beginning to snow February 5, 2010. How long will it remain visible before the snow covers it? So, the upshot of this page is that in looking at the world around me this month and thinking about learning, and taking pictures during the weird weather we’ve had, I am now thinking about what part wondering plays in learning. I wonder how we encourage questioning in school. How or when do we give kids time to pursue what they are interested in learning? If we put provocative pictures around our rooms, around our schools, around anywhere the kids will be, will they look at them and wonder, or will they be like me as a kid and NOT notice details? What will it take for us to help kids be observant and wonder? Would an exercise like this work, where they have to take pictures of a concept for a while?